Ten months after the first cases of Ebola were confirmed in West Africa, the outbreak is showing signs that it may finally be losing steam. For the first time since June 2014, fewer than 100 new Ebola infections were reported in the week ended Jan. 25, the World Health Organization said Thursday. Health officials have indicated they will now turn their attention toward eradicating the deadly and highly infectious disease, including incinerating the very facilities that helped control the epidemic. Still, the WHO said that this is no reason for the global community to become complacent in the efforts to contain and eliminate the disease. New cases of the virus continue to drop in Liberia and Sierra Leone, two of the countries hit the hardest by the outbreak. Liberia reported just four new cases last week and only 20 in the past three weeks, according to the WHO. Meanwhile, sixty-five new cases were confirmed in Sierra Leone last week — a significant drop from 117 new cases the previous week and 184 the week before that. In Guinea, however, cases increased slightly to 30, up from 20 new cases the week before. The western district of Forecariah — where the local community has shown high levels of resistance to measures to limit the disease’s spread — was the worst-affected in Guinea, with half the new cases for the week, the report said. The northern district of Mali, which borders Senegal, reported its first confirmed case in the outbreak — an unsettling finding, said the WHO. For the first time since it opened in August, Liberia’s 120-bed Ebola unit, the largest of its kind ever built, sat empty, according to the Agence France-Presse. Last year, the center, called ELWA-3, treated more than 1,800 Ebola patients. Less than a third of them survived. The emergency treatment center is now in the process of being dismantled and incinerated. Health officials have said the relative calm situation in recent days has allowed them to consider the successes and failures of their containment efforts. “This decline is an opportunity to focus efforts on addressing the serious weaknesses that remain in the response,” Brice de le Vingne, the director of operations of Doctors Without Borders, told the AFP. The health organization spearheaded Ebola treatment efforts in Liberia. “We are on the right track, but reaching zero cases will be difficult unless significant improvements are made in alerting new cases and tracing those who have been in contact with them,” he said. Health experts have said that preventing another Ebola outbreak will require investment in critical health infrastructure that has long been lacking in the region, which struggles with high rates of poverty. Some have argued that had such health care systems been in place to begin with, last year’s epidemic likely wouldn’t have reached the level that it did. 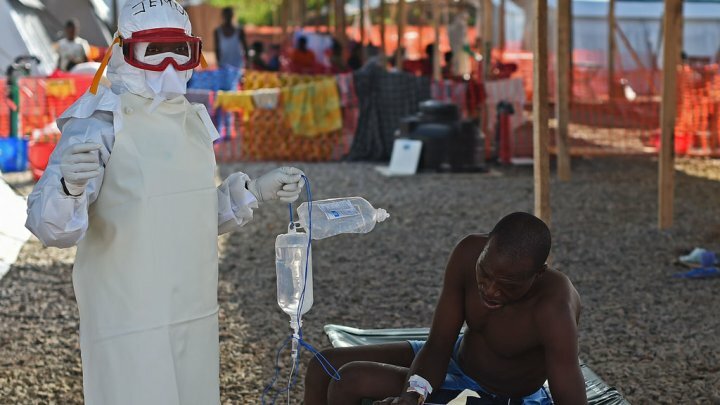 While the news out of West Africa is encouraging, health officials have urged the international community not to assume that the outbreak is under control. Even with the recent drop in cases, there are still troubling signs that the epidemic may be far from over. “The number of cases is decreasing week by week and getting to zero in many places…but we still see occasional flare-ups and we still see some surprises with new cases out of our contact lists,” David Nabarro, the senior UN coordinator for Ebola, said Thursday. There are also signs that the virus has undergone significant mutations since the start of the outbreak, which experts say could hinder Ebola control efforts. Last week, researchers at the Institut Pasteur in Paris published the findings from a genetic analysis of hundreds of blood samples from Ebola patients in which they detected evidence of numerous mutations across different parts of the genome. Additionally, there have been several confirmed asymptomatic cases, said Dr. Sakuntabhai, sparking concern that patients without symptoms might still be able to spread the virus to others. And there are signs that could be happening: according to the WHO, only 30 percent of new cases in Guinea and 50 percent in Liberia are known contacts of Ebola patients – meaning officials have no idea how the majority of patients are becoming infected. Scientists have also recently warned that the effectiveness of new Ebola treatments could be compromised by mutations to the virus. Last week, researchers from the Center for Genome Sciences at the U.S. Army Medical Research Institute of Infectious Diseases (USAMRIID) reported that they had identified changes in the current West African outbreak strain that could potentially interfere with experimental, sequence-based therapeutics that are currently in development — including one of the most promising drugs, ZMapp. And yet the greatest challenge still lies ahead, in the years after the outbreak has been brought under control. Beyond the effects of the virus, the epidemic has also caused extensive economic and social problems in the region. Food shortages threaten to cause widespread famine, while the breakdown of public health infrastructure has created entirely new health crises. Women and children, in particular, are suffering in the aftermath of the outbreak: Many of the region’s recent gains in maternal and child health have been lost, and reports indicate that sexual violence is on the rise. Meanwhile, joblessness has skyrocketed, with more than 50 percent of breadwinners in the affected countries currently unemployed, and industry and development have nearly come to a standstill. According to a recent World Bank analysis, the two-year regional financial impact of Ebola could reach as high as $32.6 billion by the end of 2015, dealing a potentially catastrophic blow to already fragile states. Liberia, Sierra Leone and Guinea were barely emerging from decades of civil war and political uncertainty and were already among the poorest countries in the world. Now, with Ebola ravaging the region, the epidemic risks unleashing an economic catastrophe that Liberian President Ellen Johnson Sirleaf has warned will leave a “lost generation” of young West Africans.